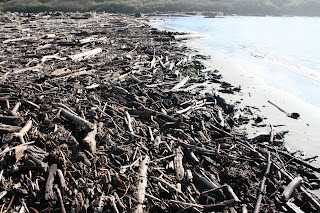 Driftwood along the north shore of Mad River looking east. Today my wife and I hiked out to the mouth of Widow White creek to see if the Burrowing owl continues to remain in the area. Lauren Lester saw one after the storm recently. I had been here a couple of times since and could not locate an owl. 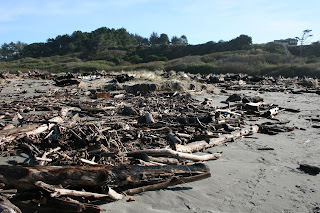 The storm has left it's mark on the area by discarding tons of driftwood and changing the landscape. It was a crisp clear day with temperatures around 45 degrees farenheit and we scanned the general area with our binoculars but failed to locate owls. 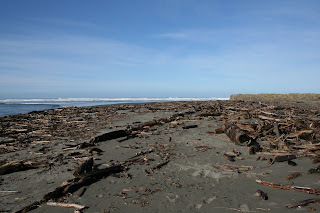 Then as we walked toward the ocean crossing the newly relocated mouth of Widow White Creek a Burrowing owl flew out of the debris toward the base of the vegetated cliff east of where we were. A few seconds later a second owl flew from a few feet away. The Burrowing owl is known for it's site tenacity. These owls tolerated a storm that moved their logs and dozens of people with dogs who walk roughshod over their site on a daily basis.